Boats are beginning to pass through a restored stretch of waterway giving access to east London's Olympic site. 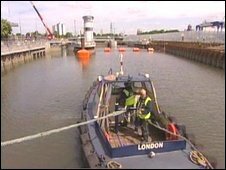 It contains Three Mills Lock, London's first new lock for 20 years, and will enable boats to carry construction material to and from the Olympic Park. Environment Secretary Hilary Benn said it would provide "a green freight route for the redevelopment of east London". British Waterways said the Bow Back Rivers route could also be used for water taxis and waste removal by water. Last month 1.4 miles (2.2km) of canal was dredged from Bow Locks on Bow Creek to the Waterworks River, beside the Olympics Park's Aquatics Centre site in Stratford. London Mayor Boris Johnson said: "By shifting noisy, dusty and heavily polluting freight vehicles from busy roads onto water, we can free up traffic and drastically improve the quality of our environment." The £20m Three Mills Lock structure at Prescott Channel includes a tidal lock, a weir and a fish pass. 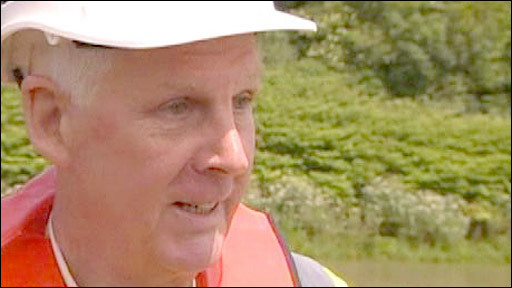 Barge worker David Allen, of Bennetts Barges, said the restoration was a "huge step" for the tug and barge industry on the Thames, which has declined over the past 30 years. "The last time that we were working commercially on the Lea navigation was in the 1970s," Mr Allen said.